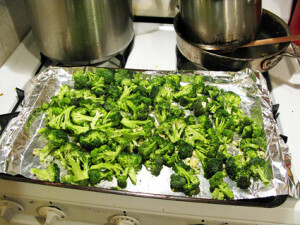 When it’s done, take it out of the oven and zest a lemon over the broccoli, squeeze the lemon juice over the broccoli, add 1.5 Tbs more olive oil, and 1/3 cup of freshly grated Parmesan cheese. This recipe is all over the internet and can be found on the Amateur Gourmet’s site. Combine all ingredients. Do not cook the broccoli, it is served raw. Keep refrigerated.